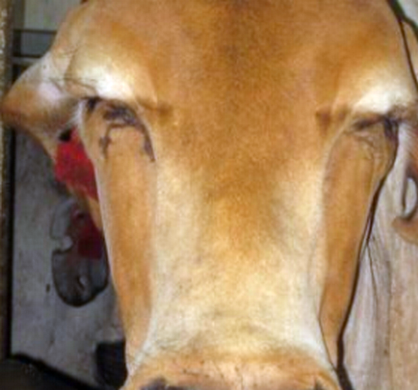 ##Live Animal Export: Emissions reprieve? Upon discharge in receiving countries, often the smell of death cloaks the ships and spreads to areas nearby. However, there is a new nasal challenge for live export on the horizon. Personally, I hate the smell of heavy marine fuel oil for sure. I'm sure I'm not a fan of the smell of decomposing bodies either. There are 'fuel tank vents' on all ships that allow fumes to escape. I used to try not to linger around them but the animals penned nearby didn't have the choice. The bull in the header image is one animal that had a terrible reaction to the fumes and his eyelids swelled up so much he couldn't see. As such he was struggling for access to food, water etc. We called him Mr Blinx, the medication didn't help Mr Blinx so a stockman and I performed a temporary surgical procedure that is usually reserved for dogs. We did a 'non-invasive entropion correction procedure' the first time I've ever heard of one being done on cattle. He could see again, mighty useful in a crowded pen. He was moved away from the fumes and within no time he had recovered, unfortunately only to be slaughtered in a country with dubious standards. In 2017 the Declaration on shipping emissions was signed by 35 nations in Paris during the One Planet climate summit. Discussions continue this year, soon to be implemented greenhouse gas (002) emission targets in all of the shipping (suggesting shipping " be totally decarbonized by the second half of this century) and new ballast water treatment goals. It seems the environment is influencing much-needed change. Change that will be taken seriously and regulated. What does this mean for live exports? The live export fleet globally consists of approximately 140 ships with an average age of more than 35 years. The oldest salt-water fleet in the world. These ships are thought to be already living on borrowed time and are rapidly losing any shred of social licence to operate. "The reality of a lower sulphur, lower emissions future for shipping is already here. ECA and IMO 2020 regulations mean that in addition to the shifting use trends of traditional marine fuels, ship owners and operators are increasingly turning to the use of alternative marine fuels to meet the challenges of a rapidly changing legislative and operational landscape," says Ian Thurloway, Chevron Marine Lubricants brand and marketing manager. Can the oldest fleet in the world afford to retrofit their ships with sulphur scrubbers and dispose of the extracted sulphur properly? Some exporters are crying poor in Australia already over high livestock prices. Is now the time they consider diversifying or transitioning to chilled and frozen meat exports instead. Avoiding the contention of cruelty and begin to rely on more modern refrigerated container ships instead. It's predicted that the scrap yards around the world will be inundated with old vessels, ones that are no longer economically viable to convert to compliance. This raises another problem. The risk of abandoned crews. 2017 saw record numbers of abandoned crews around the world by morally bankrupt owners. I fear that some live export operators may operate till the eleventh hour and disappear I only hope that their crews are repatriated by their employers and won't have to rely on a charity. 2020 may seem a while away. 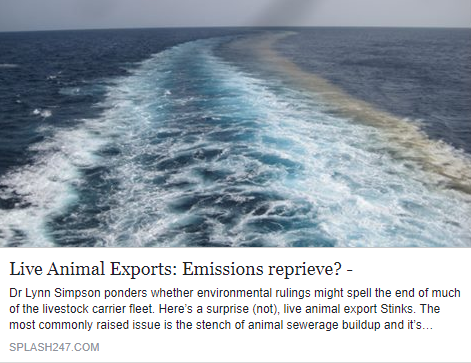 However, In Brazil this week a Judge presented with a petition regarding the exportation of cattle from the port of Santos in Sao Paulo state, ruled that the cruelty and environmental issues surrounding this draconian trade needed addressing. The Environmental Authority from the city of Santos has fined the operator in Brazil approximately US $660,000 for atmospheric pollution (the ships odour) invading the city of Santos. An issue the residents of Fremantle, Australia have been complaining about for decades. Another fine of approximately $490,000 was issued by the Environmental Secretariat from Santos City due to animal mistreatment and pollution. Currently, all live animal exports are suspended from Brazil as a result of this week's decisions. Is this the beginning of the end"